The history of descending into the depths of the ocean is filled with dubious facts, half-truths, and impossible claims. How can one really tell that someone has traveled into the high-pressued darkness of the cold ocean, where no trace is left and no flag marks the discovery? What credence should we give, without any external verification, to the claims of a man who purports to have performed a seemingly impossible aquatic feat? These are the questions raised by the story of German engineer and inventor Heinz Sellner. That, my friends, is a snappy introduction. I’m all in. And, full disclosure, I actually finished reading the entire article before posting this. 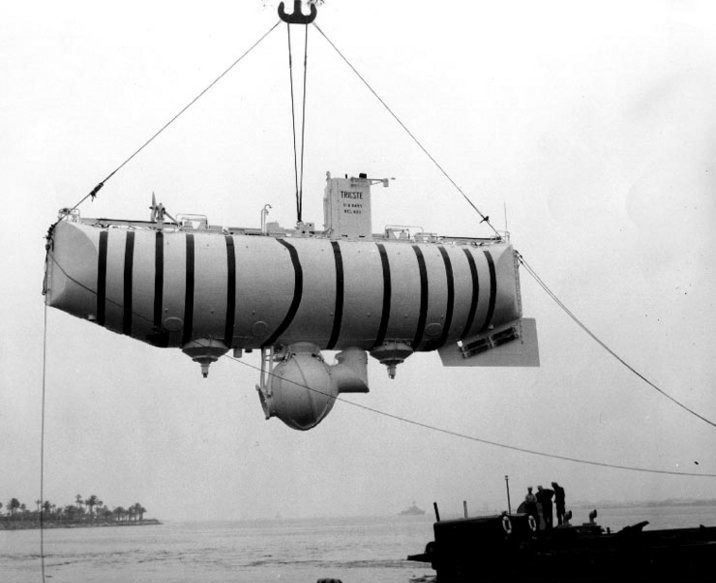 It was good, and I learned something about the bathyscaphe that I never before knew: it was filled with gasoline. [Headsplosion.] Someone out there is like, that’s not true. Doubters, I present the WikiTruth. Side note: I think deep ocean exploration is fascinating, which makes me biased toward finding this introduction especially awesome. When I was a kid, my grandmother would give me the fold-out maps from her National Geographics to hang on my wall. My favorite by far was the world ocean floor map that accopanied an article about the ALVIN submersible. I used to chart my way from continent to continent along the scabby techtonic boundaries. I had memorized the deepest points of the Mariana Trench.